Bratislava gallery Eggplant was established in 2012 and dramaturgically is focused on the author's concepts of Slovak and foreign jewellery makers. In April, there was Sylvia Jokelová´s exhibition that through a project called Schmuckaustellung relativized standard and conventional perception of the concept of jewellery. 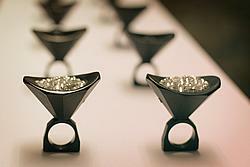 Sylvia Jokelová – one of the most representative authors of design in Slovakia is a professional jeweller. Since the very beginning, she likes travelling across free / designer genres in her works. A series of identical rings installed as courses on a festive board is a source area. Funnel-shaped ring allows the viewer to attach a ring on the eye - thus he becomes the director's of own projections and can indulge in the luxury of private experience undisturbed by external influences. The rings are gradually filled with glittering rhinestones, the charm and intimacy fade away, the evoked atmosphere ceases to be realizable. Sylvia Jokelová prefers non-classical materials for jewellery and is interested in creativity which is not limited by professional training. The exhibition had two phases - the actual presentation of the author and the workshop Design your own ring, where trainees tried to design and implement their jewellery under her leadership and subsequently exhibited them together with Sylvia's jewellery.